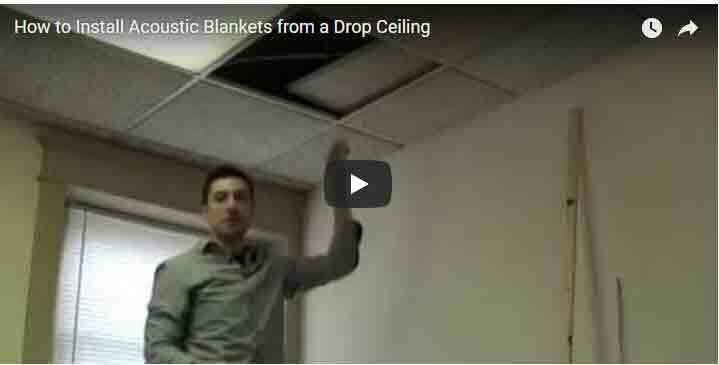 If you need to do acoustic room treatment with sound absorbing panels or acoustic blankets and have a drop ceiling in your room, this video will be very helpful. It suggest a neat way to hang acoustic blankets from a drop ceiling without any drilling or installing any additional screws. Out of Producer’s Choice Blankets, we created a space 6 feet x 6 feet with blankets covering the entire wall from floor to ceiling. Total cost ( not including the blankets) was under $10. As acoustic panels, we used oversized sound blankets Producer’s Choice ( acoustic-sound-blankets-sound-absorption-panels-producers-choice). If you noticed we did not hang the blankets flush with the wall. This is very important for better sound absorption and noise reduction. That extra air space makes a lot of difference. To see how effective these blankets are, watch our video showing how well these blankets performed when treating a drum room. Thanks for watching and make sure to subscribe. This entry was posted in Instructional Videos, Videos and tagged home studio with sound blankets, install blankets from drop ceiling, pod casting studio, recording in a home studio, Sound blankets, voice over studio at home.